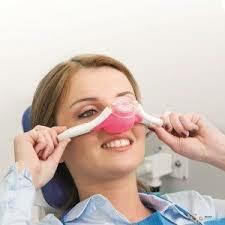 Nitrous Oxide, known to many as laughing gas, is the most commonly used form of sedation in dentistry. Nitrous oxide (N2O) is a gas which you can breathe. It is colorless, odorless and doesn’t irritate. It is mixed with Oxygen in a device called a regulator to achieve proper concentration.